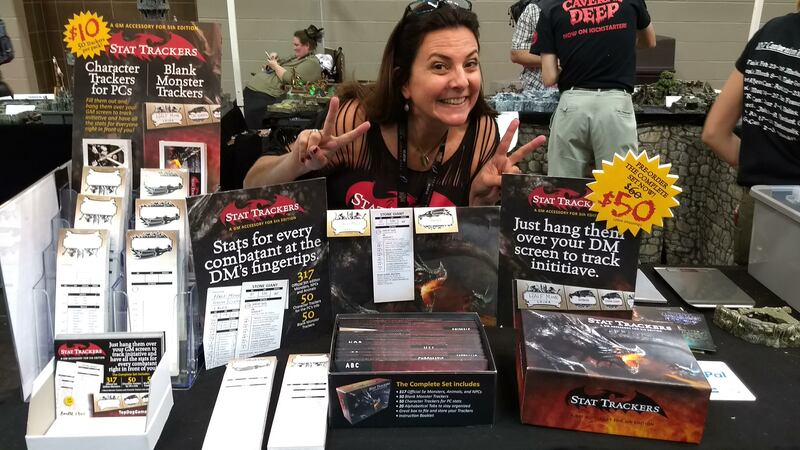 GenCon started out in the infancy of RPGs (role playing games) and has traditionally been THE place to buy, play, and learn about them ever since. Here’s what the “big names” are doing as well as some smaller titles and various tools and accessories for gaming. 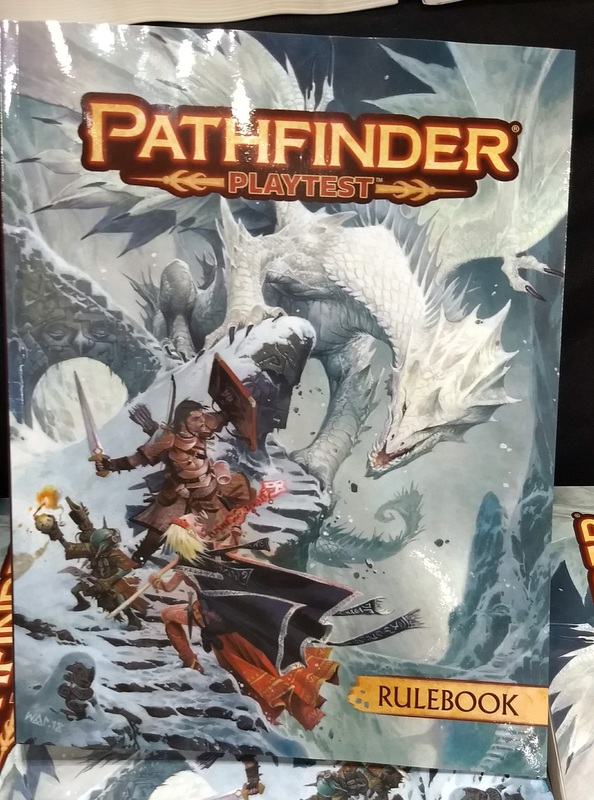 Two big names dominate the RPG field, Wizards of the Coast with Dungeons and Dragons and Paizo with their Pathfinder (and now Starfinder) series. We’ll take a look at them later but let’s start with a few more “indie” titles to give them some screen time. 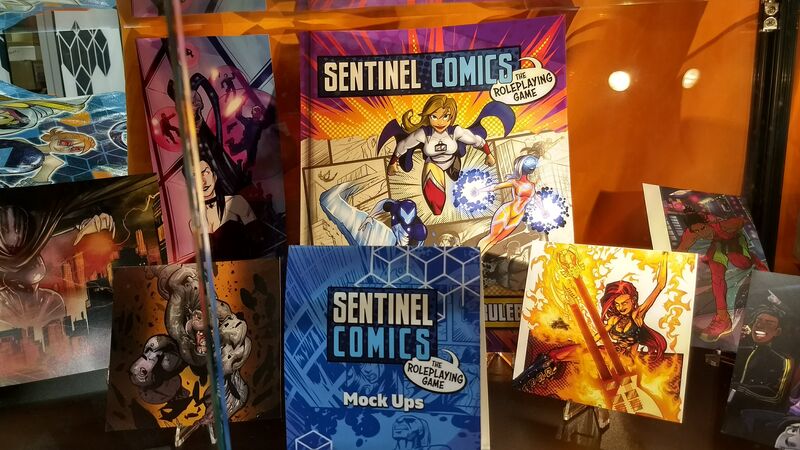 Greater Than Games released an introduction to Sentinel Comics RPG in the middle of last year. The system leans towards storytelling rather then an all-out dice fest but remains a mixture of the two. Since storytelling is a big part of the game, the rules rely less on the minute details and relies more on the GM (gamemaster) to adjudicate situational difficulty levels or bonuses. This somewhat rules-lite style meshes well with a superhero environment where characters traditionally are finding creative uses for their powers and abilities. 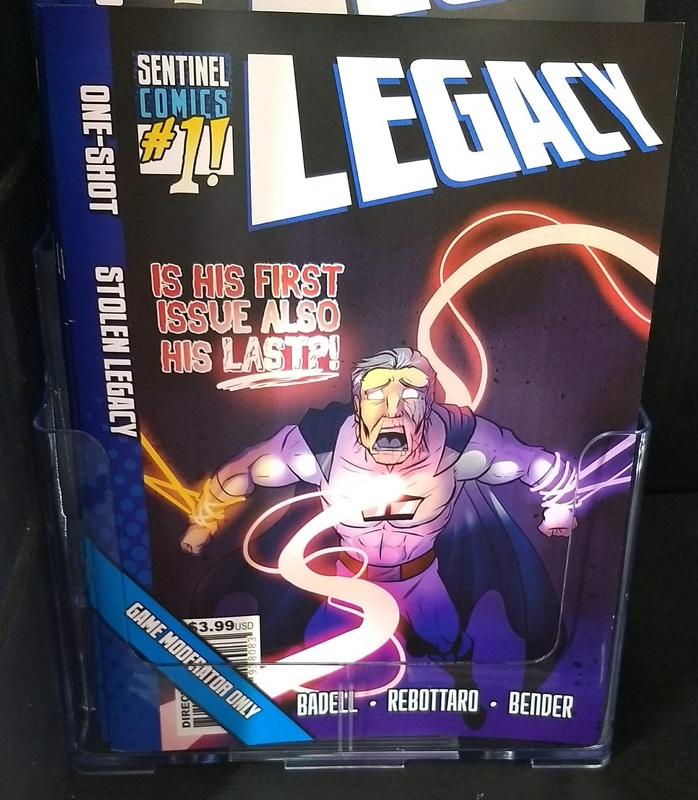 At the convention, a new supplement/adventure was released entitled Stolen Legacy. It contains a new hero team (in character sheet form rather than the tutorial-style ones in the base game) and adventure designed for them. The adventure (and characters) are all available as a free PDF, but a nice printed version is available for purchase if one desires. If I recall, the full RPG will have a kickstarter this year with a release planned for GenCon 2019. Thornwatch (in stores now) is a collaboration with Lone Shark Games and the comic site Penny Arcade. The folks at Penny Arcade provided the lavish artwork and much of the storyline while Lone Shark Games refined the game rules. I need to call attention to the artwork a second time, as it is one of the big selling points of the game. If you appreciate the graphic novel style of the art, this is an RPG that leans heavily into its art throughout the game to help story immersion. The theme is set around the Eyrewood, a high fantasy setting that includes organizations such as the Lookouts (boys) and Daughters of Eyrewood (girls) who protect the forest. 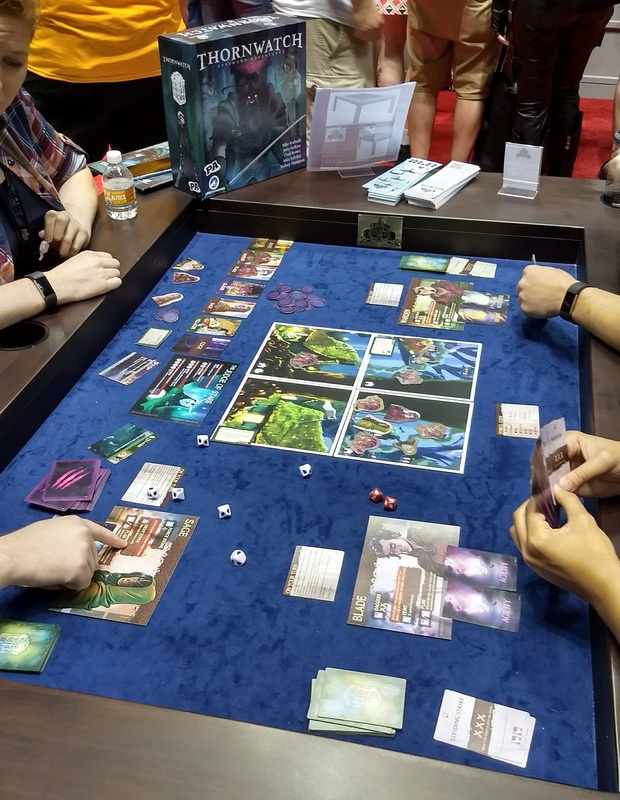 Encounters run almost as a boardgame, with a set of combatants in a tableau while player characters use their resources and abilities to manipulate that row in their favor. A goal of the designers was to create an RPG game where “no one checks their cell phone” as the game experience allows players to participate even on other players’ turns. The base game has the typical character styles (healer/tank/damage dealer, etc…) and several branching storylines that can be pursued. An expansion, Dark of the Wood brings in more esoteric character styles that use more untraditional play styles, like using wounds as resources. It does not have a branching storyline, but has an episodic arc. Players pick a starting season (spring/summer/fall/winter) and then go around the loop until they get back to the season in which they started. In Numenera, Monte Cook Games has one of the more intriguing settings I’ve found. Set in the far, far future huge chunks of insanely complicated technology lie around in abandoned buildings and ships. Some daring inhabitants of the world venture into these locations in the hope they might come out with bits and pieces of items containing wondrous power. Some may even have a talent for combining them into useful items. If you want a cinematic look at the world, check out the fancy short story video they made. It has been out awhile, and Monte Cook Games is now “re releasing” the core rules in the book Discovery. It is the same rule set, but with lots of new art, rules updates, additional powers and other options – think of it as taking in customer feedback to improve the presentation. The book goes into more detail in areas most requested by fans. Past material is fully compatible and anything the references the previous core book can be used with the new book, as looking for the old book numbers in the new one will lead you two the lower corner of the page which identifies where that rule appears in the new book. Along with Discovery, the all-new Destiny book has ideas and tools for what to do in the new world. There are three new archetypes (including the Arkus which is almost a “Mayor” class – interacting with large groups over the long term, or the Delve which is a spelunker/scavenger – like Rey in Star Wars.) It contains a new mechanic – player intrusion, where players can spend their experience points to affect the in-game environment (much like a Plot Point) found in some other RPGs. Both books include three adventures. The two books are available separately or together in a nice slip case. On the non-setting side, Monte Cook Games is producing a new book (Kickstarter starting August 24th) entitled, Your Best Game Ever. It provides advice and tools for use in any RPG setting. The book is full of easy-to-use “recipes” that can be applied to your game. 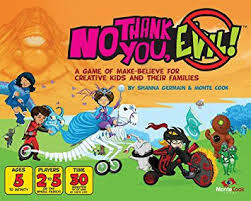 Finally, I’m also a fan of their very kid-friendly RPG, No Thank You Evil! It is once again out of print but should be back again for the holidays. There are two new supplements for the game, I’m a Guide and Uh-oh Monsters. Unsurprisingly, Uh-Oh Monsters provides a host of new creatures (and accompanying paper stand-ups) and a new adventure for the system. 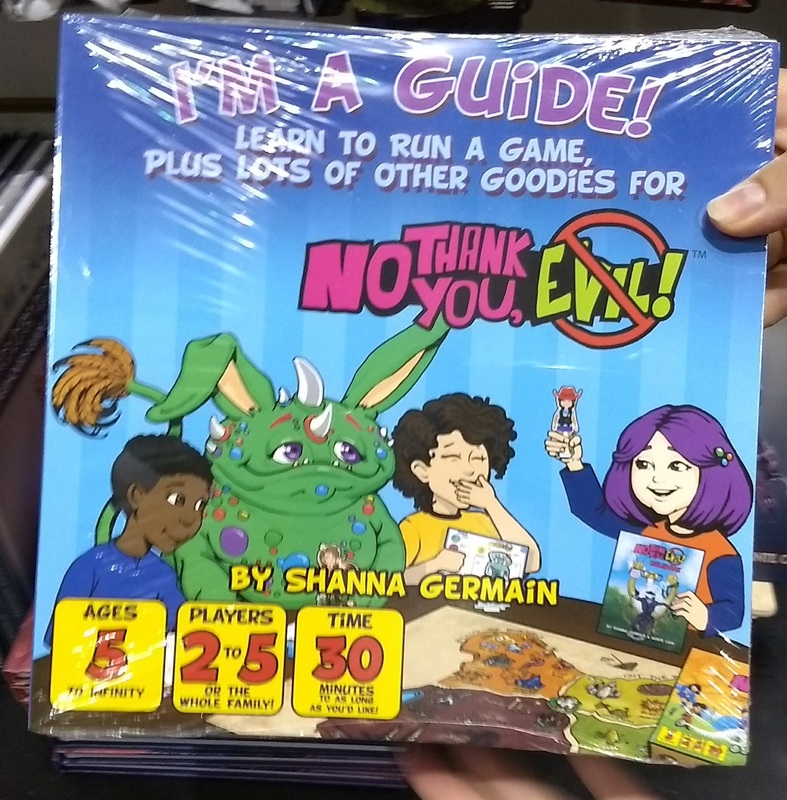 I’m a Guide is a hands-on guide for kids to help them figure out how to GM a game for their friends. It contains stickers, props, and a full workbook for kids to go through in learning and preparing for a game. I was attracted over to the Ravendesk booth by the art featuring Nikola Tesla. 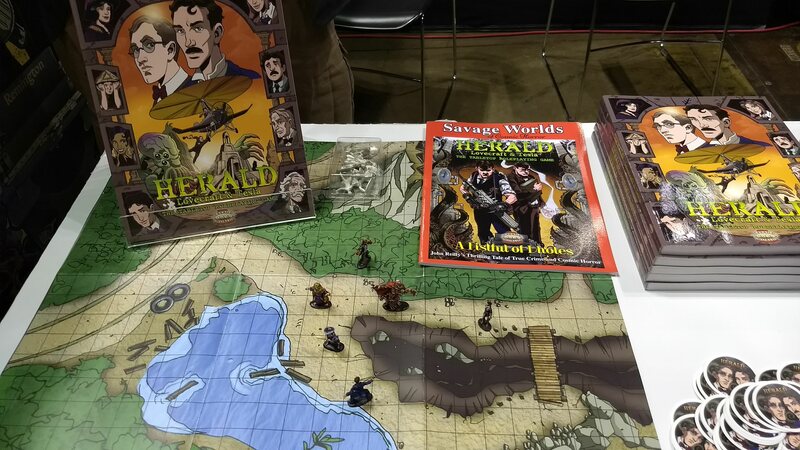 Herald: Lovecraft and Tesla is an RPG setting based on the comic series, using the popular Savage Worlds rules set (which tries to keep things family-friendly – deemphasizing adult themes like drugs, etc…) Herald is a mashup of steampunk (of the Tesla era) with a bit of Chluhu thrown in. I’m not normally a Chluhu fan, but it looks like the game lies heavily in the steampunk adventure side of things rather than gothic horror, keeping the game family friendly. Tesla loses his wife (Amelia Earhart) and is pursuing his arch enemy, Edison (obviously.) Despite the cthulhu theme, the game should be fairly family-friendly. One touch I like is the large number of pregenerated characters available – play as Disney, Hemingway, Langston Hughes, and any other of a large number of people of the era. 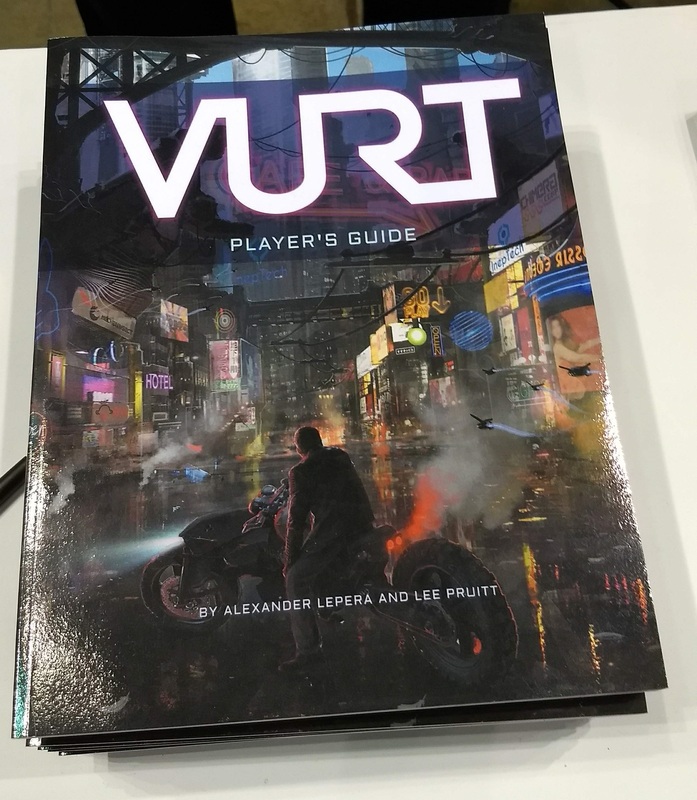 Ravendesk Games’ other title on display was VURT: The Tabletop Role Playing Game. VURT is based on the 1990’s book of the same name. It has a much darker theme than Herald, with a strong emphasis on drugs (characters use “feathers” to enter alternate realities) and other adult themes. A pretty dark cyberpunk setting, it’s not really a setting for my personal tastes. 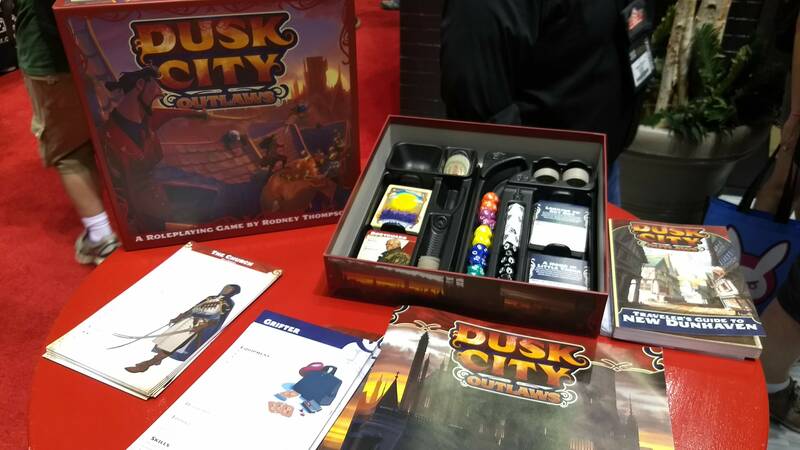 Dusk City Outlaws is a new RPG-in-a-box that uses boardgame style components to deliver a pick-up-and-play RPG experience. Everything in the game is setup to enable players to pull out the box and just jump into the game. For example, if your regular game group has poor attendance one night, you could pick a gamemaster and get up in running quickly. Character creation consists of picking an organization and an archetype. Pull out the reference card for each and you’ve made your character. 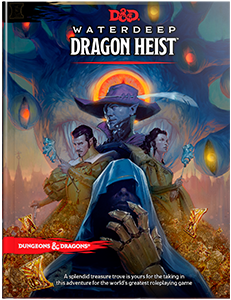 The Judge (gamemaster) has six premade scenarios to choose from, each centered around a western-themed outlaw type experience (like a heist, kidnapping, or working a con.) The game does have some campaign arc options (where rewards tend towards story rewards – like organizational promotions of favors owed) but is more focused on the idea of one-off experiences. As with most RPGs, at least the good ones, things are not set up to have a “right” solution to any puzzle and players can be as creative as they wish. All enemies are printed on a handy deck of cards with stats on one side and a photo (to show the players) on the other. Results are determined by two sets of dice, one for success/failure and the other to determine any upside or downside to the action performed. One resource, “heat”, is used in the game to slowly escalate the intensity of the storyline and the GM can spend it to create new complications on the fly. This is also meant to reduce GM prepwork as “heat” can be an easy way to introduce new plot twists to the game. 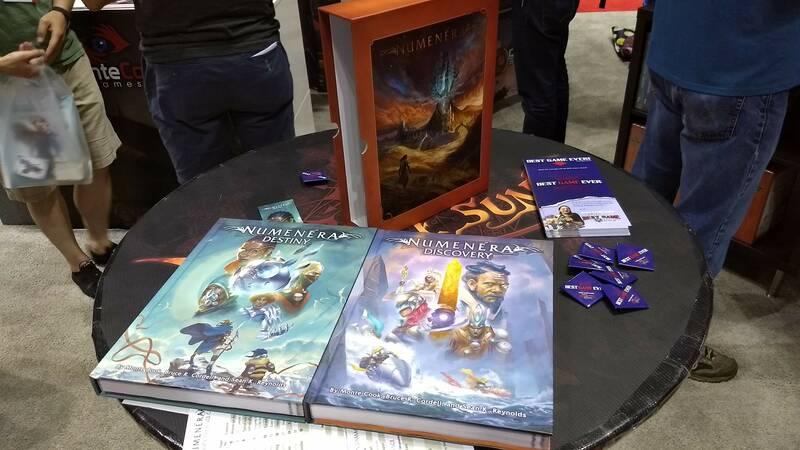 The game is produced in a boardgame sized box, complete with sets of dice and everything needed for play, again to make it as “pick up and play” as possible. The game was released at GenCon and is available for sale on the Scratchpad Publishing web site. In Starfinder news, Starfinder Armory is out and it contains a pile of equipment such as powersuits, armor, and weapons. In January, a new 6 issue campaign arc will commence with the Dawn of Flame, and it will be a bit more family-friendly than the current, much darker campaign. The big upcoming news (to me) will be the spring release of Starfinder Beginner Box. It will include all the expected accoutrements such as quick play rules, pregenerated characters, reference guides, and an adventure complete with maps. If you’re looking for accessories for your game, Paizo has you covered with a multitude of Flip-Mats and Flip-Tiles the flip tiles have the same coating as the flip-mats, so you can write on and erase almost any sort of marker (wet, dry erase, even permanent.) The Flip-Tiles currently come in a base set and a Dungeon Perils expansion has has various traps and other nasty dungeon features. Solid metal dice are now “the thing”, and at the top of the photo shown here you can just make out sets of metal dice (a zinc alloy, in various colors), running about $35 a set. However, if you don’t want to risk making a dent in your table when rolling, but still want that metal look, Chessex has a line of faux-metal dice. Slightly heavier than standard dice, they are coated with a metallic sheen. At $16 a set, they’re roughly half the cost of solid metal – easier on your wallet and your table. Makers of the powerful (but high learning curve) map making software, Campaign Cartographer, have just released a new program, Dioramas 3. This program provides images, textures, and templates that can be used to design plan which can be printed out and assembled to make 3D terrain. Walking by the booth, I stopped to take a photo of Stat Trackers produced by Top Dog Games. They consist of foldable cards that you can hook onto your GM screen. One side has the name of a person (or monster or whatever) and the other has all the appropriate stats on them. Hook them on a GM screen so the names are facing out and the stats facing inwards and a GM can keep track of all the pertinent statistics during the game. Rearrange the cards to keep track of whose turn it is or to track initiative. A full set of cards includes 50 blanks, 50 character cards, and 317 monsters and NPCs from the public SDR for Dungeons and Dragons. It also comes with a handy index box. Hello Mr. Matt, really you share an amazing list of RPGs games. 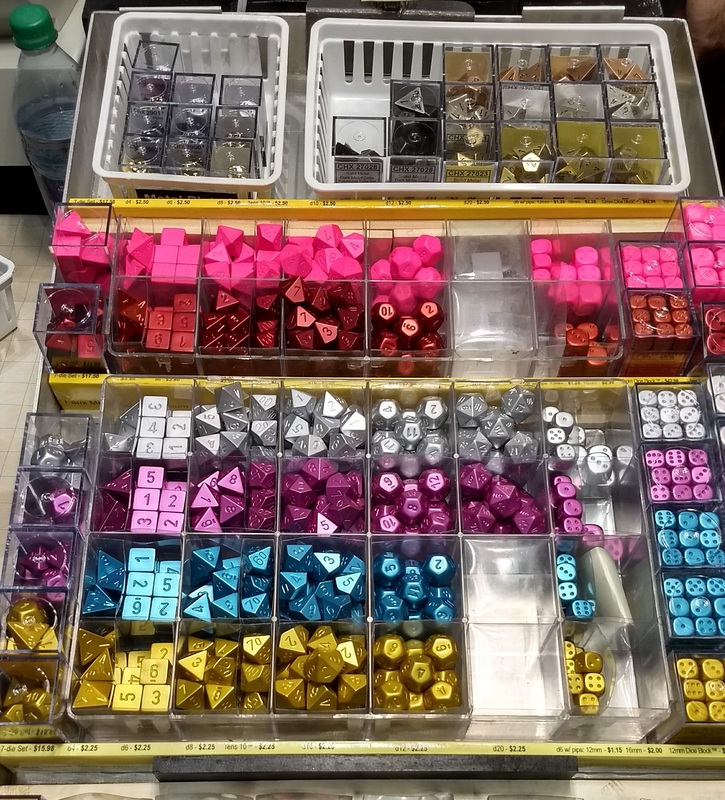 Especially i like the chessex Solid metal dice and wizards of the cost. These metal dice are nice and heavy, well balanced, roll well, and feel great in the hand due to attractive color collections.